We bring the showroom to you, in the comfort of your own home! Please fill out this form and one of our flooring specialists will schedule an appointment with you to find the best flooring solution for your home. With over 70 years of flooring experience – and now offering complete Kitchen and Bath remodeling – we’re confident we can serve your needs with the expertise and advice you need to make the best choice, and at a price you’ll love! 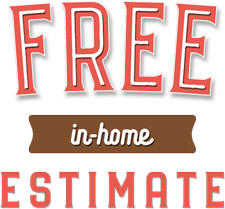 Yes, our installation team are professional craftsmen and install everything we sell; carpet, tile & stone, vinyl products, hardwood, and laminate. Do your installers work for you or do we hire our own? Yes, our installers work for California Flooring And Design and the labor is provided by us in order to manage the job. We offer a 5 year installation warranty on all our work. How qualified are your flooring installers? We hand-pick our installers according to their expertise and we ensure they meet our high standards. We believe our success depends on the quality of our installations and we guarantee our work. Can you give me a flooring estimate over the phone? If you have your exact measurements and the manufacturer with the style, we can give an estimate over the phone. If we will be installing, we will need to measure it. No. We offer a free in-home estimate where we bring the showroom to you. If you’d like an estimate, fill out the form on this page to schedule an appointment. What kind of flooring products do you carry? We carry a wide variety of flooring; carpet, hardwood, laminate, tile (porcelain, ceramic and stone) Vinyl ( Spc, Lvp, glue down).